Some concerned citizens have filed a Public Interest Litigation (August 17 2015) to stop the highest award of Maharashtra Government, Maharashtra Bhushan to Babasaheb Purandare. Purandare is known for his work ‘Raja Shivaji Chatrapati’ and the play ‘Jaanata Raja’ (wise king) his is not the first time that such a controversy around Purandare has come up. Few years ago Maharashtra Government had appointed him as Chairman of the Committee which was to plan the statue of Shivaji in Arabian Sea. The Maratha Mahasangh objected to this appointment on the ground that Shivaji was a Maratha while Purandare is a Brahmin. Purandare’s interpretation of Shivaji presents him as the one who was devoted to Brahmins and Cows (Go Brahman Pratipalak) and the one who was against Muslims. This interpretation of Shivaji has been the major version used by sectarian political groups. As this on one hand presents him as upholder of supremacy of upper caste and at the same time looks down upon Muslim kings. Maharashtra has seen many a controversies on Shivaji issue times and over again. There was an attack on Bhandarakar Oriental Research Institute (BORI), Pune few years ago. The issue at that time was that this institute had helped the western author James Laine for writing his book, ‘Shivaji: Hindu King in Islamic India’. In this book he had cast aspersions on Shivaji’s mother by mentioning some rumors. Maratha-Brahmin politics was at the root of this. BORI is regarded more as being Brahminical. In yet another controversy, just before the elections in Sangli area (2009), the poster of Shivaji killing Afzal Khan with a knife, was the provocation for communal violence, in which one person was killed and a tense atmosphere was created. The symbolism was that Shivaji is representing Hindus while Afzal Khan represents Muslims. This is the fertile ground for hatred and the consequent violence, which polarized the communities and the communal forces won the election. One recalls another controversy around Shivaji and that was when the Human rights activist Teesta Setalvad had prepared a hand book of history for school teachers in which she narrated the incident of Maharashtra Brahmins refusing to coronate Shivaji as he was a Shudra. The priest from Kashi; Gaga Bhat; had to be invited, who did coronate him but with the little toe of the left foot, as that is the organ which according to Brahmanical norms is lowest in the body hierarchy. The local Shiv Sainiks objected to this handbook on the ground that how dare someone call Shivaji as Shudra? History has its own truth and emotions operate on different wavelength! What is true is that Shivaji was a King who reduced the burden of taxation on the poor peasants. That’s what made him popular amongst the masses. Also the legend of Shivaji asking his army to return the Muslim daughter in law of Kalyan’s Nawab is a matter of deep respect for him amongst the people of Maharashtra. The memories of his policies towards the rayyat (cultivating farmers) make him very revered figure in Maharashtra. Lokmanya Tilak was the first one who recalled Shivaji’s role by organizing a Shivaji festival. Tilak presented him as protector Brahmins and Cows. Since then Shivaji came back in the social memory but with upper caste orientation. 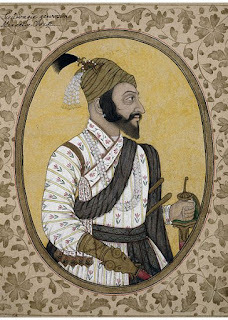 The later popularization of Shivjai was done by communal forces that centered the narration on Shivaji’s battles with Aurangzeb and Afzal Khan. This was in a build up to Shivaji’s own kingdom. These battles with these two Muslim kings are highlighted while Shivaji’s battles with Hindu kings are underplayed or omitted from the recall. While his battle with Aurangzeb was for power; the official who came from Aurangzeb’s side was Raja Jaisingh who was a big official in Aurangzeb’s administration. In case of Afzal Khan it was Shivaji’s Muslim body guard who advised him to carry the iron claws, while on Afzal Khan’s side we see Krishnaji Bhaskar Kulkarni as his secretary. The battles for power have been given religious color. Today Shivaji on one side is being used for sharpening communal (Hindu Muslim divides) and on other hand between Brahmin-Marathas.